Because my oldest son has oral sensory issues he doesn’t like to eat fruits or vegetables. In an attempt to reduce the fights around our house over vegetables I decided to add fresh juice to his diet. This would allow me to get everything he needed into him and maybe a few things that we would never eat. As a mom, you always worry that your kids aren’t getting everything they need nutritionally, and this would hopefully fix this. I initially purchased the Lexen Healthy Juicer to juice wheatgrass but was excited when I learned it would do most fruits, vegetables and leafy greens. The plan was to get a power centrifugal juicer and then use the healthy juicer just for greens as it does a better job ‘ringing’ the juice out. As soon as I did my first juicing, I realized that the Lexen could be perfect as our only juicer as I won’t need to be juicing jugs and jugs. Out of the box the Lexen Healthy juicer needs just a few pieces to be snapped together to get going. I had read a lot of great reviews about it online and was immediately impressed by the quality of the juicer from the minute I got it together. Convenient, this juicer attaches easily to the counter with a suction cup that is locked in place at the side of the unit. 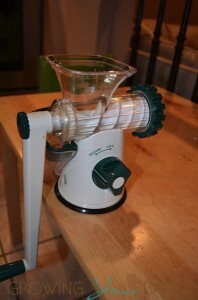 Designed to juice leafy greens, the healthy juicer does an incredible job of getting every drop out. 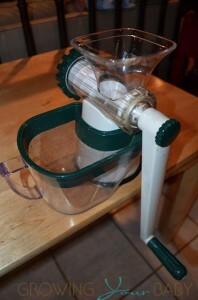 The fruit and vegetables are fed into the hopper and moved along by a plastic auger, which also moves the juice back to the opposite end of the juicer once it has been pressed out. 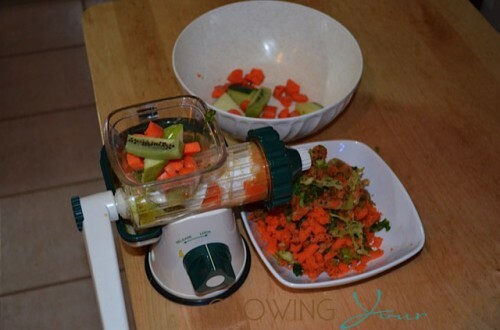 The Lexen Healthy Juicer does a great job of breaking down the fibers and squishing the good stuff out. 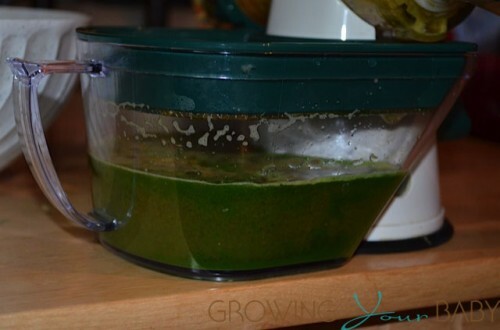 The pulp that comes out of the machine after you have finished juicing the wheatgrass, Kale and parsley is quite dry. The fruits are a bit more moist. Some of the finer pulp does manage to make its way out with the juice but it is filtered out by a screen that sits over top of the reservoir. Before choosing which fruits and vegetables to juice, I did a lot of research on their benefits. Wheatgrass was high on my list because of its high amount of vitamins, antioxidents and amino acids. Kale was next because it is very high in beta carotene, vitamin K, vitamin C, lutein, zeaxanthin, and rich in calcium. Kiwi is a super duper fruit. It is high in fiber, vitamin C, folic acid and it also has phytonutrients which repair DNA, act as the body’s protection against some cancers, and function as antioxidants. Parsley is a good source of antioxidants (especially luteolin), folic acid, vitamin C, and vitamin A. Proclaimed health benefits include anti-inflammatory properties and a boosted immune system! With the exception of the wheatgrass, we often have these on hand so I knew that they would act as good staples. To give my juice a bit of ‘spice’ I also bought some ginger root. My first combination was 5 stalks of Kale, handful of parsley, 2 apples, 4 stalks of celery and a tiny piece of ginger. While it was good, I found that the celery was overpowering and the taste lingered after so I cut it back to 1.5 stalks for my next juicing and it was better. I later tried 5 stalks of Kale, a good handful of fresh cut wheatgrass, 1/3 cucumber, parsley, 1 apple, 2 carrots, 2 kiwis and a small piece of ginger. This has proved to be a popular one for us and it is currently the one I make every day. My youngest likes apple, carrot and ginger juice in the morning and he drinks 50ccs of the green juice in the evening. Because my 7-year-old isn’t a fruit and veggie guy, we chose to give him his juice with a syringe and this works. He does 50ccs of the ‘green juice’ every day and also an additional 50ccs of raw pineapple juice as well. The Lexen Healthy Juicer does a really great job of juicing the pineapple even though it is a bit soft. I can get about 450ml of fresh pineapple juice from one cone. I juice pineapple first and then my green juice after so the kale and parsley can push the pineapple pulp through the hopper. This ensures that you don’t waste any of your juice. Plus, it adds some extra flavour to your next drink! 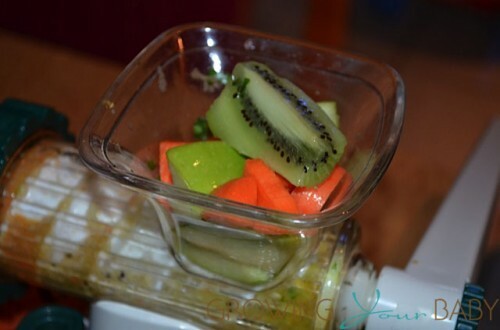 We have been using the Lexen Healthy Juicer for more than a month and love it. It was only $60 and allowed me to try juicing without investing hundreds of dollars into a machine. In the New Year I will probably look into getting a power masticating juicer to cut down on the amount of time I spend in the kitchen. For us, the masticating juicer is a better choice because we love to juice greens and it does a better job with them. Those looking to do apple, carrot, beet mixtures may like the centrifugal juicers better and they juice the produce quicker and do quite a good job of breaking down the tougher fruits and vegetables. As a mom, I am always looking for ways to keep my healthy. Our family is constantly evolving and the way we do things forever changing. Adding fresh juice to our day ensures that everyone gets their daily recommended intake plus a bit more than they would have had in the past. I have to admit that the boys winced a bit the first couple times they tried my ‘mixes’, but they don’t seem to mind now. We’ve talked a lot about all the good things the fruits and veggies are doing for their bodies so it is easier now to get them to try new drinks. Put your softer fruits through in the middle and then your heartier ones after to help push the pulp through. Dice carrots and apples to allow them to go through the machine easier. Use a table that is completely flat and use both the suction pad and table anchor to secure the Juicer. If you are looking to juice celery, apples, peaches, spinach, peppers, nectarines or Kale these should be purchased from the organic counter and they are on the ‘dirty dozen’ list, a group of foods known to have the highest pesticide residue. For maximum nutritional benefits, the fresh juice should be consumed immediately. I do sometimes, however, transfer it to a glass jug and put it in the fridge for 20 minutes to allow it to chill. If you are going to juice everyday consider participating in a compost program in your community as you will have a lot of veggie waste each juicing. Do you juice? Do you have a recipe you would like to share? We have been juicing for our family for two years now. We start the day with a mango pineapple ginger juice and do a green juice with spinach, carrot, apple and watercress twice a week. I have lost about 15lbs since starting our juicing regiment because it replaces the bagel and cream cheese I used to eat. I have also noticed that my hair and skin are much healthier since starting. Such a great way to get kids to consume their fruits and veggies. I found your review while looking for more information on a Wheatgrass Juicer. Thank you for posting the pictures and tips. I am hoping to start juicing in the new year and am looking for a machine that won’t cost too much. This one looks like it could do the job. How long does it take you to juice a whole glass? @Olivia J With prep time, juicing and clean up, the whole process takes about 25 minutes. I bought the Lexen manual juicer to see if juicing would be right for us and while I love it, I would like an electric model to reduce my time. I have, however, read that this model squeezes more juice out than it’s electric counterparts. So I guess it’s a catch 22. I don’t juice every day but I like to do 1 mango, 1/4 pineapple, 1 carrot and a slice ginger. This one is better done in the centrifugal juicer because the mango and pineapple are too soft for the masticating ones. This is a good juice and the ginger adds a little zing! @Katie – that juice sounds good! and I have 2 mangoes on my counter right now. We do wheatgrass and coconut water straight from the coconut not the tetra packs they sell in stores. As you mentioned Wheatgrass is a power food and the coconut water is nice to dilute the sharp taste. Coconut water is also high in its own nutrients, plus it has enzymes that help in the digestion and metabolism. http://www.nutrition-and-you.com/coconut-water.html It is a good thing to add to your diet. Congrats to you for getting your family on a juicing diet. The benefits are endless. I have this juicer and love it but do you find it pops off the counter when you are trying to juice denser fruits and vegetables? Drives me crazy especially when the juice spills as a result! !